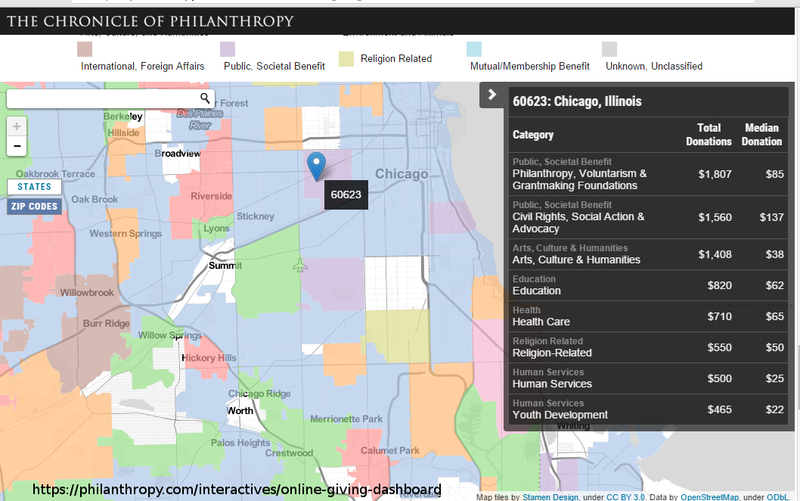 I've just been introduced to a web page hosted by the Chronicle of Philanthropy, which hosts an interactive map that you can use to look at donations made in different cities, and/or different zip codes within a city, to charities in different categories. Here is the link. 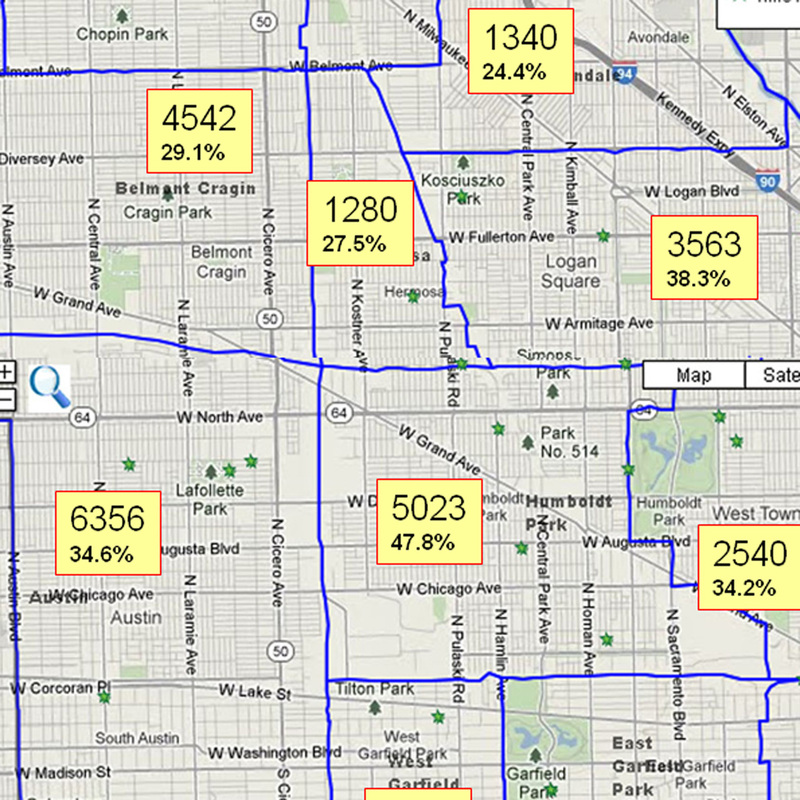 I zoomed into the Chicago region, then clicked on different zip codes. For instance, when I click on zip code 60623, the Lawndale area of Chicago, I see $500 in human services donations and $465 in youth development donations. The map below shows that the North Lawndale area has 4717 youth between age of 6 and 17 living in high poverty. $465 in donations do not pay for many tutor/mentor programs for that many kids. The 60657 zip code, located along the Chicago LakeShore, between Irving Park Ave and Diversey Ave, shows $30,173 in donations for youth development programs and $110,105 for human services programs. Look at the map on page 7 of this presentation. It shows that there less than 650 youth, age 6 to 17, living in the 60657 zip code, representing a low percent of all the youth age 6-17 in the zip code. My maps plot the number of youth by community area. Thus you'd need to look at this zip code map to know which zip codes cover which community areas. Keep in mind, this only shows one source of donations, so I'm hopeful that there are more funds going into high poverty zip codes than this platform might show. What I'm interested in is the potential to gather information on philanthropic and government funding from many sources, and focus it on individual zip codes, and individual categories of non profits, and then teaching people to use this data to tell stories that help improve support of organizations in high poverty areas. Last week I posted a story on the Tutor/Mentor blog, following the high profile shootings of a 9-year-old boy and a 20-year-old girls. In that story I showed maps of political districts, illustrating that preventing youth violence was the responsibility of many layers of government. Take a look. My goal is to teach leaders, volunteers, youth and community activists in different neighborhoods to create their own map stories, following my examples, and using platforms like the Chronicle of Philanthropy to show how poverty neighborhoods are under funded by government and philanthropy, and to work together to try to change this over a period of years and constant story telling. I feel that more people, with diverse talents that are much more creative than mine, are publishing these map-stories on a regular basis, we'll begin to influence a better distribution of resources into all poverty neighborhoods, and thus the growth of more and better programs helping young people and families overcome the challenges of poverty. If you're creating such stories, share your link. If you'd like me to give a talk or coach you to take this role, I'm available for a small fee. 2-27-2017 update - the links to the Chronicle of Philanthropy site no longer work. I'm not sure if they have discontinued the site, or not. If it's been discontinued, that would be too bad. It shows how difficult it is to build and maintain data mapping. I've pointed out uses of concept maps on this blog and written a few articles about Systems Thinking on the Tutor/Mentor blog. Today I was introduced to a page on the Know-Why-Net web site that is mapping a " Systemic view on terror threats after the 2015 Paris attacks." Click the link . Know-Why-Net before. This visualization of the terror threat and response is just one of many visualizations on the site. I encourage you to visit and build your own understanding of these tools. A couple of years ago I was introduced to a platform hosted by the Foundation Center, named the Philanthropy in/Sight map. I included a graphic from that site, and a link in this 2014 article. That link no longer works and in a meeting this week I learned that the Foundation Center had discontinued this program. I also learned that the National Center for Charitable Statistics, a program of the Urban Institute, has replaced this service. I've just started to browse the site and become acquainted with its features. I encourage others to do the same and use comments on this blog, or your own blog articles, to describe those features and how they are being used to improve philanthropic support of hard-to-fund organizations like those serving youth and families in high poverty areas. I've been creating maps to show where volunteer-based tutor/mentor programs are most needed in Chicago and other cities, based on poverty levels, poorly performing schools, violence and other indicators. Scroll through this blog to see articles using such maps. View this PDF to see a set of maps showing the number of youth, age 6-17, who are in households below the poverty level, in each Chicago community area. Most of my maps include Chicago tutor/mentor program location information from a Directory of volunteer-based tutoring and/or mentoring programs operating in high poverty areas of Chicago, which I've been maintaining since 1994. See my list. I focus on volunteer-based, and normally free, tutoring, mentoring services, realizing that parents in these areas don't have the income to support paid tutors, and that paid tutors, because of the cost, could not remain part of a young person's life for more than a few weeks or months, not for multiple years. Thus, I've not focused extensively on the availability of for-profit tutors (who charge an hourly fee). This weekend I was introduced to a web site that is trying to collect this information. 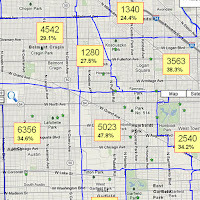 After some email conversations the site's owner, a University of Chicago graduate, created a map showing the number of tutors in his database, for each zip code in Chicago. The site includes a search feature that enables you to search by zip code, to get contact information for tutors who focus on that zip code. Furthermore, it shows the average cost per hour charged by tutors in different zip codes. The site is named "Find Tutors Near Me" and you can find information about Chicago at this link.